It was late in the summer, and Charles Revels and Wayne Stone decided to start selling and servicing chain saws and lawn mowers. The new business was named Stone and Revels Repair Service. 3 years later, Wayne moved home and sold his interest in the business to Charles. In 1963, Charles’ nephew, Billy Hip, joined the company, and a couple year’s later, Charles’ brother Bobby was hired. 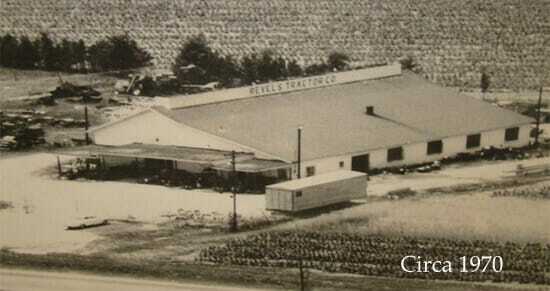 Three years passed, and in 1968, Charles incorporated the business and changed the name to Revels Tractor Co. Inc. – making Billy and Bobby equity partners in the process. 1970s: Revels Just Won’t Stop Growing! During the late 60s and early 70s, Charles Revels enjoyed exponential growth. Revels became a licensed John Deere dealer, moved from downtown Fuquay-Varina to its current location on US401, and Charles hired his four children, Turner, Jeff, Chris and Julie after college graduation. During the early 80s, high interest rates and a severe downturn in the agriculture economy caused Revels to join the golf and turf maintenance industry. It was a natural fit in 1986 when John Deere decided to develop a new golf and turf division and make Revels Tractor Co. Inc. one of its main distributors. The 1990s saw Revels open a new location in Myrtle Beach, SC while remaining one of John Deere’s top volume distributors. Since then it has maintained a committed leadership role in the golf community throughout the Carolinas and Virginia – graciously investing in fundraisers and associations to promote kindness and integrity throughout the industry. In November 2007, Revels Tractor Co. Inc. merged its agriculture, residential and commercial mowing and landscape equipment businesses in North Carolina with a company named Quality Equipment, LLC. The bigger and better Revels changed names to Revels Turf & Tractor. So there you have it. We’ve walked you through over 50 years of Revels history. Yes, we’ve changed our name, switched industries and merged companies during the half-century. But, that same commitment to fair pricing, excellent service and the Golden Rule that Charles Revels inspired in 1961 is still alive and well today in all that we do. Meet the team behind the history!